Global equity markets remain extremely strong with global economic data continuing to improve, particularly from China in early April. Furthermore, positive sounding ion the US-Sino trade negotiations have helped share markets higher to start the second quarter. Here we look at the UK benchmark stock average, the FTSE 100. Another push higher Wednesday to another new cycle and 2019 peak at 7354.5, reinforcing the recent break through a key long-term retracement level at 7317.5, to further build on Monday’s bull gap (7221.5-20), to keep the bias higher Thursday. The early February push above 6998.5 sets an intermediate-term bull trend. We see an upside bias for 7354.5; break here aims for a key peak at 7373, then towards 7398/7400. But below 7307 opens risk down to 7295.5, maybe towards 7255.5. 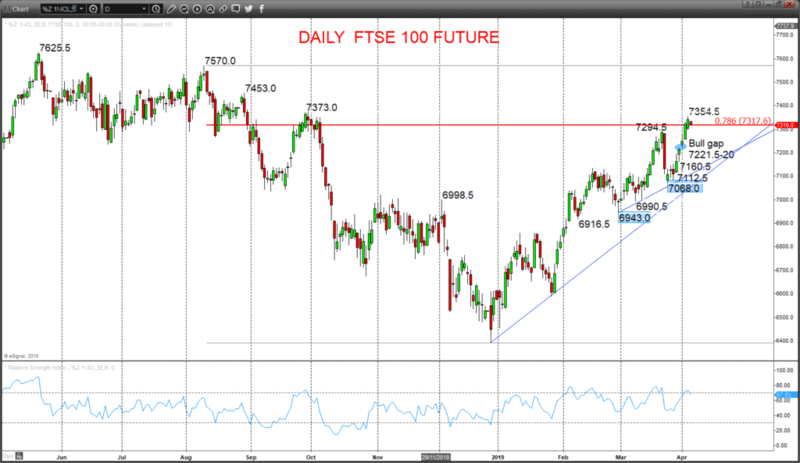 Intermediate-term Outlook – Upside Risks: We see an upside risk for 7453 and 7570. What Changes This? Below 7068 shifts the outlook back to neutral; through 6943 is needed for a bear theme.